Now and again, there are articles that float around the Internet that reflect on the phrase, “Cash is king.” Recently, I’ve seen a few articles that touch on the topic with interesting perspective. The question that these posts seem to address is this: When writing an offer, is the cash offer king (read: the best offer on the table)? In a short sale transaction, there are some significant benefits to cash offers. For one, the cash buyer does not have to obtain a mortgage loan. This very fact can speed up the closing of the transaction. Additionally, a cash buyer may have a little bit of wiggle room when and if the bank does not approve funds for certain items required for the short sale closing. For example, if there is overdue HOA or a required termite report, the cash buyer might be able to contribute some funds to cover those fees. Lastly, in a pinch and if the foreclosure auction is imminent, the cash buyer can close more quickly. That last fact is often seen as a positive by the short sale negotiators and processors at the bank. That being said, often times cash buyers (by the very nature that they are cash buyers) are more fluid. Since these buyers do not require a loan, they can continue to look at properties and shop around. Additionally, many cash buyers are investors that are looking for an investment with a strong return. So, if the bank counters their offer at a higher price, they might move on to another investment. Lastly, as an investor buyer, the cash buyer is not emotionally attached to the property the way a first time homebuyer might be. For example, a first time homebuyer might want a specific school district or neighborhood, whereas the investor is often more focused on the financial bottom line. Now, with respect to short sale negotiations, few and far between are the times when bank employees will speed up their corporate time frames or take a lesser dollar amount because a cash buyer has submitted an offer. If an investor, such as Fannie Mae or Freddic Mac, has done their due diligence and decided upon a minimum net amount, the very fact that the offer is cash will not usually coerce the lender into accepting something less than a pre-determined net. Additionally, it is not often that a bank will speed things up when a cash offer is on the table. I’ve gotten a few short sales approved in record time—several in under a week. However, in all of those cases, I already had a fully approved package in the hands of a higher-level short sale executive who was just waiting for me to submit either a new offer or an offer that already met some pre-determined or pre-approved terms. 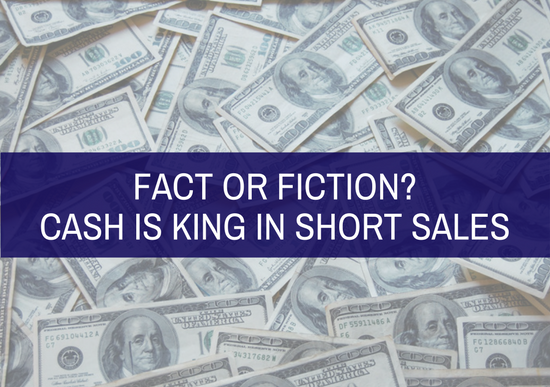 While cash certainly may be of benefit when considering the purchase of a short sale, as to whether cash is king—I guess it would all depend upon your definition of the word king.